I replied, “Because they just weren’t selling, and they aren’t shelf-stable from year to year.” I went on to explain about the freedom I’d felt at no longer being slave to my products and how liberating it is to be able to cut products out of my line when they’re no longer performing as I’d like them to do. When I rebranded to form Coastal Carolina Soap Co., I resolved to keep the product offerings limited. Even taking a less-than-objective view towards my display and my site under Sara’s Soaps ‘n Such, I thought it looked cluttered, and from a buyer’s perspective, the plethora of choices was overwhelming; there were just too many soaps from which to choose. So after ruthlessly purging my inventory, I vowed, “Never again would I have so many soaps!” That means, when I add a soap, I would have to choose a soap to get rid of. I’m introducing a lovely new soap called Green Hibiscus Peach, which is a delightfully sophisticated peach with floral notes. I’m also excited to announce the return of Orange Blossom, a soap I’d planned to carry over to the Coastal Carolina Soap brand from the beginning. These soaps will be ready early May, just in time for Spring Fest. So, what’s going? 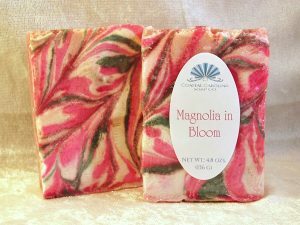 After assessing my database and past year’s sales, I decided to discontinue Magnolia in Bloom. I have ten of these beauties left in stock, and they will only be around for another month or so. While I’m selling those soaps, I’ll be showing off the two grand new soaps that are coming out across my social media channels, and I’ll be broadcasting my swirling magic in our Facebook group. I hope you’ll join us! Previous Previous post: It’s Here! And I’m so excited!